Makita DHP453 18V Combi Drill Specification. 18 Volt Makita Combi Drill. Torque Settings 16 drill. No Load Speed H: 0-1300/L: 0-400rpm. Noise sound pressure 78dB(A). Images shown for illustration purposes only. Makita DHP458 Combi Drill Makita DTD152 impact Driver Makita DTD152 Impact Driver Twin LED Job light with pre-glow and afterglow functions. Twin LED job light. 2 lights on: 20% to 50% of full battery capacity. Makita DHP453 Combi Drill Makita DTD152 impact Driver Makita DTD152 Impact Driver Twin LED job light. Torque Settings S/H Nm: 16 drill. Compact overall length of 137mm. No Load Speed: H:0-1,300rpm L:0-400rpm. 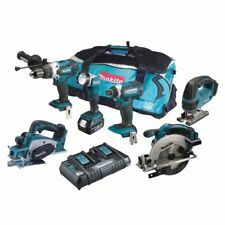 Makita DTD152Z Makita DHP481Z Very compact with overall length of only 138mm. Compact and lightweight, 4-pole motor. Compact overall length. 2 x 3.0Ah BL1830 Batteries. One touch bit installation. Part Number DLX2005MJ. Item model number DLX2005MJ. 1 X LXT 18V DRILL DRIVER. 1 X LXT 18V COMBI DRILL. Style 18V Cordless li-ion 2 Piece Cordless Kit (2 x 4Ah Batteries) in MakPac Case. Battery Cell Type Lithium Ion. 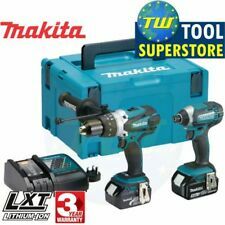 Makita 18v Brushless 3 Piece Kit DHP459 Combi Drill, DTD129 Impact Driver and DHR242 SDS Plus Rotary Hammer with 2 x 3.0ah Batteries, Charger and LXT400 Bag Stock Code: MAKBLKIT3 This 3 piece kit includes 1 x DHP459 combi drill, DTD129 impact driver, DH242 SDS plus rotary hammer, 2 x 3.0ah BL1830 batteries, 1 x DC18RC charger and LXT400 carry bag. Model DHP459 Cordless Hammer Driver Drill has been developed specially for light to medium duty drilling and fastening applications. This model is equipped with a basic BLDC motor (BrushLess DC motor) specially designed to provide, above all, more work amount on a single full battery charge. Model DTD129 Cordless Impact Driver has been developed specially for light to medium duty fastening applications. This model is equipped . 1 x DHP453Z Combi Drill Body Only. 1 x 8378647 Inlay. Single sleeve keyless drill chuck for easy bit installation/removal. No Load Speed - H: 0 - 1300 / L: 0 - 400 rpm. Conveniently located push button for forward and reverse. 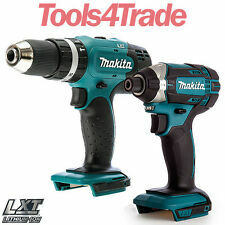 Makita 18v Brushless 3 Piece Kit DHP459 Combi Drill, DTD129 Impact Driver and DJV182 Jigsaw with 2 x 3.0ah Batteries, Charger and LXT400 Bag Stock Code: MAKBLKIT2 This 3 piece kit includes 1 x DHP459 combi drill, DTD129 impact driver, DJV182 jigsaw, 2 x 3.0ah BL1830 batteries, 1 x DC18RC charger and LXT400 carry bag. Model DHP459 Cordless Hammer Driver Drill has been developed specially for light to medium duty drilling and fastening applications. This model is equipped with a basic BLDC motor (BrushLess DC motor) specially designed to provide, above all, more work amount on a single full battery charge. Model DTD129 Cordless Impact Driver has been developed specially for light to medium duty fastening applications. This model is equipped with a basic BLDC motor (BrushLess DC motor). 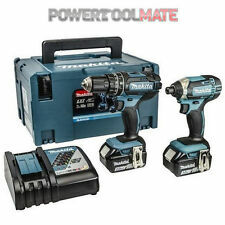 Makita DHP484RFJ 18v LXT Brushless 2-Speed Combi Drill including 2x 3.0Ah Batteries. It's also more compact than the DHP480 at only 182mm compared to 199mm. Brushless motor. Battery Compatibility: 18v Lithium-Ion (LXT). Makita DTD152Z Makita DHP481Z Very compact with overall length of only 138mm. Compact and lightweight, 4-pole motor. Compact overall length. 2 x 5.0Ah BL1850 Batteries. One touch bit installation. Whats Included with the DHR202RMJ Combi Drill. New shorter SDS Drill from Makita 330mm long rather than 410mm long on the DHR240. Chuck (SDS). 2x 4.0Ah 18V BL1830 Lithium-Ion Batteries. More compact design at only 330mm long and weighs only 3.2 kgs. The energy production for both the combi drill and impact driver are more efficient than brushed DC motors as there is no loss of friction caused by brushes. Makita 18V BRUSHLESS Combi Drill Specification. Makita DTD152Z Makita DHP481Z 1 x DTD152Z 18V Impact Driver Body. Variable speed trigger. Battery level indicator. Very compact with overall length of only 138mm. Compact and lightweight, 4-pole motor.